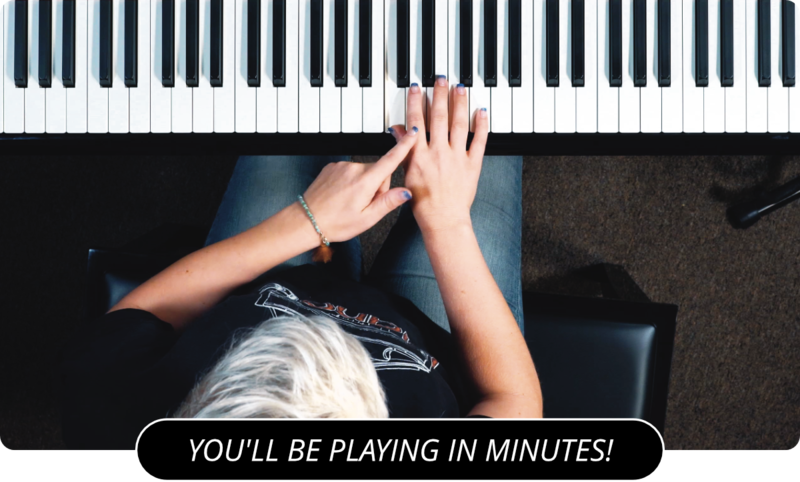 Learn How To Play The Piano In This Piano Lesson! Now that you know a scale, you have an important building block to music. Scales are used to create melodies and to construct chords. A chord is a collection of three or more notes, all played simultaneously. Go back to Middle C and play it. From there skip a note and play the E, and then skip another note and play the G. Those three notes form a chord known as a triad, which simply means that there are three notes in it. Now that you know the notes of the C chord, play them all at once. Music wouldn't be very interesting with just one chord, so I'm going to show you two other chords that can also be played with just the white keys. Let's start with an F chord. You remember where the F key is right? Good, hit the F key now and follow the same pattern we did to create the C chord. From F, skip a note to A, then skip another to C. Play them all together and you have an F chord. Now I'm going to show you the G chord. Where do we start the G chord? You guessed it, on the G key. From G skip a note to B, and skip another to D. Play those three notes together and you have learned three chords. If you play those three notes in order, you'll find they have a choppy sound to them. We can smooth that sound out using what are called chord inversions. Play a C chord. Now, keeping your first finger on the C, move the other two and play an F note and an A note. Take a look at the notes you have just played. C, F, A. Remember an F chord is made up of the notes F, A, and C. What you just played is an F chord with the C on the bottom instead of the top. Moving the notes around in this manor is called inverting the chord. Another way to invert a chord is to take the root note and put it on top. If we do that to the G chord, we end up with the notes D, B, G. Play that inversion of the G chord from the F inversion that I just showed you. Now when you play all three chords together it sounds much more smooth and melodic because your hands aren't jumping around the keyboard as much. It is also slightly easier to play. But playing the piano is more than just your right hand. Now I am going to show you what to do with your left hand. As you play a chord in your right hand, play its root note with your left. The root note is simply the note that the chord is named after. C for a C chord, F for an F chord, G for a G chord, etc. Play a C note with your left hand and simultaneously play a C chord with your right. Now an F note with your left hand and F chord with your right. G note with your left hand, G chord with your right. When we put chords in an order like this, we are creating a musical phrase. This particular type of phrase is called a chord progression, because we are progressing through a serious of chords. C-F-G-C is what we call a 1-4-5 progression. I'll explain what that means in the next video, so stay tuned! Next you can watch Part 2 - Learn To Play Piano .